Sometimes it gets pretty confusing to do the conversion of minutes (of which an hour has 60) into decimal numbers (of hours) when filling in your timesheets. Errors to this mostly happen when people try to do timesheet in Excel and they made a column to enter hours. It's pretty easy to enter 0.15 into a column thinking you entered 15 minutes but actually you only entered 9 minutes (0,15 x 60). When using Temponia entries are made with our graphical interface (see here) and all reporting is done in hours. This ensures no errors can be made. You just drag the timeslot you worked on something in the calendar and that's it. Reports and invoices all come out correctly. It has taken us some time but we're happy to announce that timers have been rolled out. 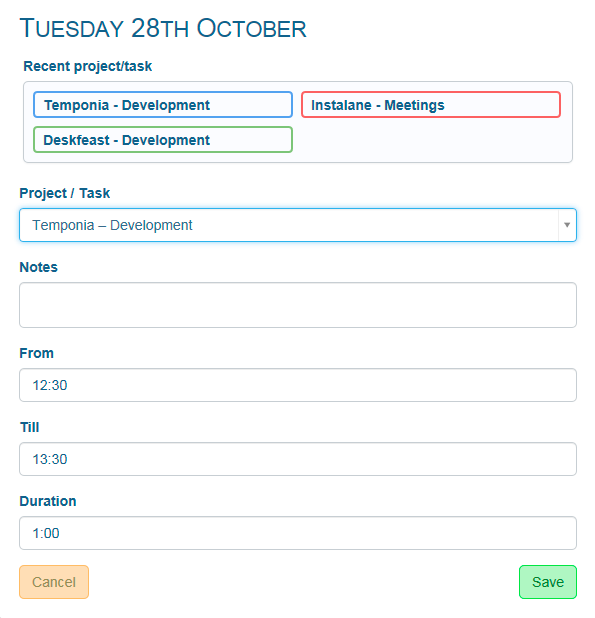 When you start working on something, you can now search the task/project and a timer will start automatically. This timer is kept throughout all your sessions and is always visible in the navigation bar on top of each page. Even if you open Temponia on another computer you'll see the same timer running. As soon as you're finished with your task, you simply press the stop button and a corresponding timesheet entry will be created. If you want you can add an additional description of what exactly you did. According to Benjamin Franklin only two things are certain in life: death and taxes. Even though nobody likes to pay them, the addition of a tax component to our invoicing module has been a much requested feature. 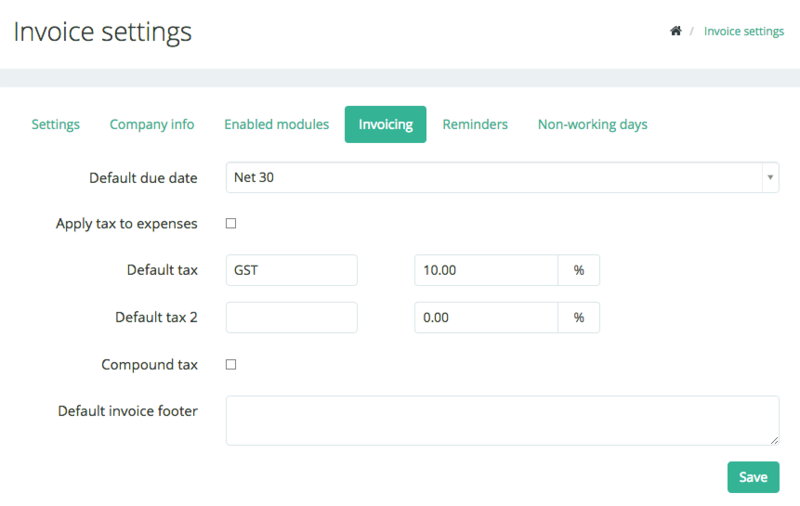 With our latest release you can now configure taxes to be charged on your invoices. To do so you can go to the company settings page and click on Invoicing. In case you don't see this tabsheet, you'll need to enable the invoicing module first under "Enabled modules". By default no taxes are being charged. You can enable a tax component by setting the percentage and a description. It's possible to configure up to two taxes which can be compounded. Taxes aren't being added to expenses but if you wish to do so, you can enable this as well. To facilitate managers and administrators we introduced a new view that allows visualizing the graphical timesheets of multiple users at once. 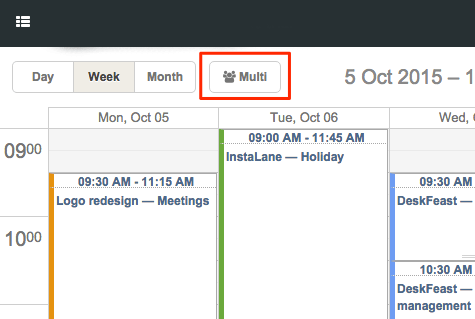 In order to use this view you need to click on the multi button on the left top side of the timesheets. Next you will be able to select the users you want to see. 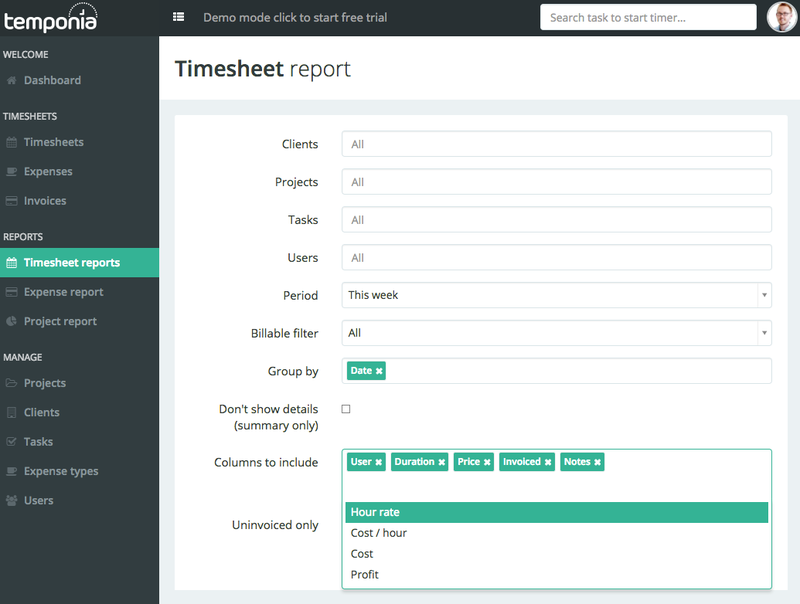 After this you see the timesheets per day of all the users you selected next to each other. In this view it is also possible to move items from one user to another, as long as both users are assigned to the project. Aren't we all forgetful from time to time. I know I am. The problem with forgetting to fill in timesheets is that if you need to do it afterwards, it will take you much, much more time to do so. You'll need to backtrace your whole month (or even worse). I used to go through my calendar, installed latitude to keep track of where I was, at what time, I even had an app installed on my phone which filled a separate calendar with the phone calls I made so I could puzzle back together my timesheets. 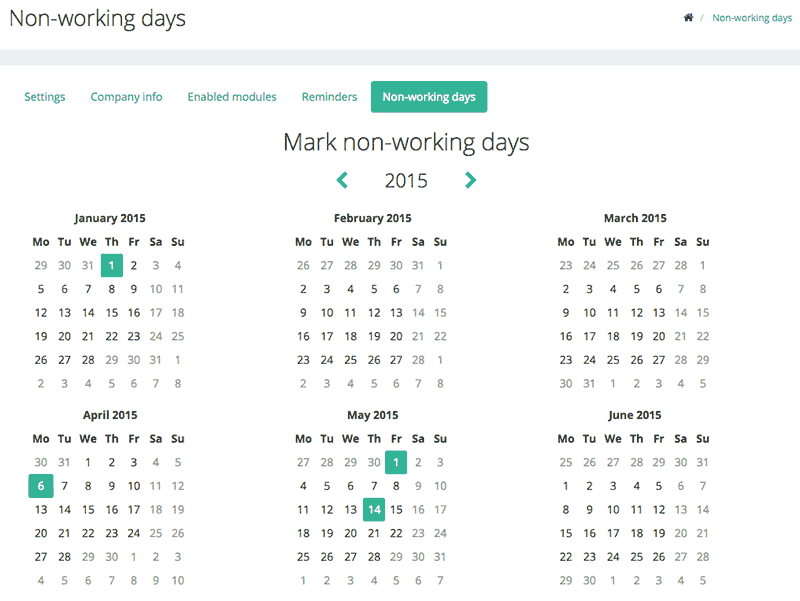 Reminders let you specify your company holidays as well as days when you or your employees aren't working. 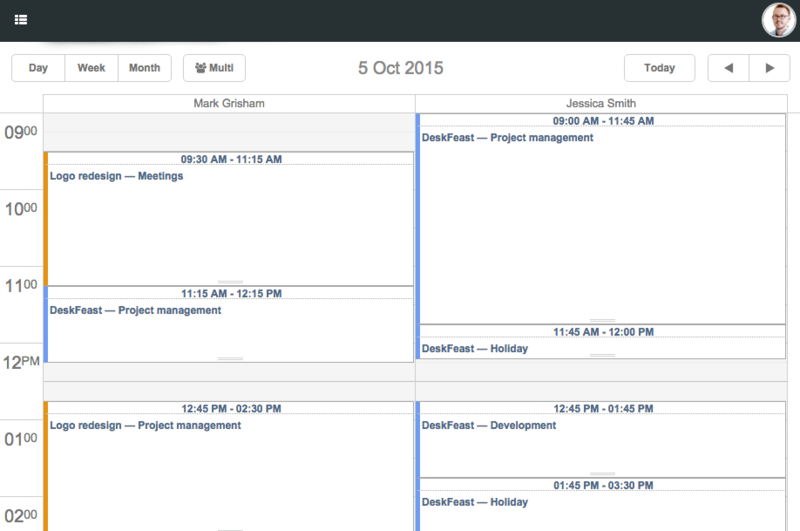 Every user has a calendar which can be filled in with periods and type of absence (holiday, sick leave, etc...). To be able to properly judge and track projects you need clear and useful dashboards. We already have the main dashboard but now we're taking this one step further. All the projects on the main dashboard are now clickable so you can drill down to project level to see the number. 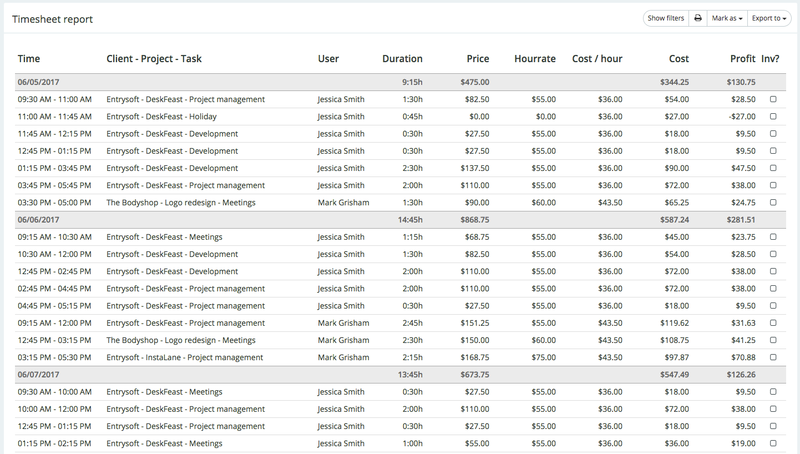 Project dashboards give you an overview of hours worked during the last weeks, months, ... but also which tasks or users have been logged for that particular project. 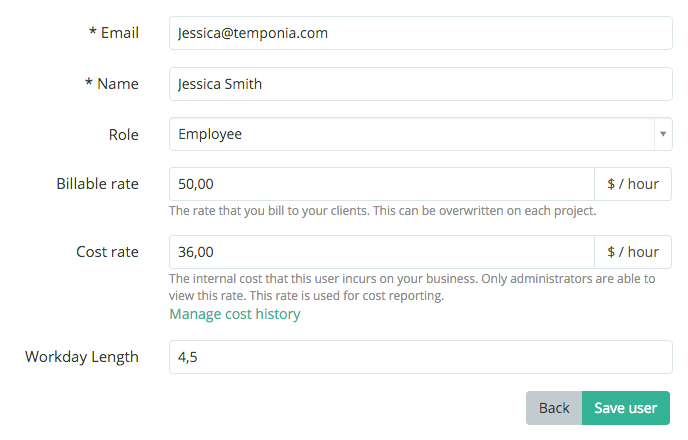 And so did we at Temponia :-) We just improved the grouping capabilities in our timesheet reports. While users could previously only group by one item at a time, it is now possible to select multiple and users can even choose the order of grouping themselves. We also added several date/time related groups.